Were we really that surprised when we heard of Phil Robertson being fired from the hit A&E television â€œrealityâ€ show for making comments to a GQ reporter? Itâ€™s funny how we want reality in our television, but not too much reality. We donâ€™t want to hear the reality of their belief in Jesus, or praying in His name around the family dinner table. We especially donâ€™t want to have to endure the reality of their â€œintolerantâ€ Christian beliefs regarding the Bible and if they actually live their lives as though it were true. The network tried to make this family and their beliefs more palatable to its viewing audience by adding bleeps in recorded conversations as if to hide curse words that were not actually there. They were also told they could not pray in â€œJesus nameâ€ around the dinner table at the close of the show. Both of these issues were worked out between the Robertson family and the network â€“ but it shows how the world desires a â€œcutting edgeâ€ and â€œrealityâ€ as long as itâ€™s their own reality and no one elseâ€™s. Remember the networkâ€™s only desire is to make money. They are a business, so they put shows on the air they feel people will watch. They do not have some agenda to shape the morality of the culture. They are not stupid (blind to reality perhaps; but not stupid.) They have done polls, market research, etc. and reached the conclusion that America wants the Duck Dynasty in their living room, the seat covers for their minivans, and the bobble heads on their kidâ€™s shelves. A&E sees them as a moneymaker, when that changes the show ends. But as with most things that have an inkling of light, we donâ€™t like it when itâ€™s shined in our face. This is not a freedom of speech issue. The world comes to Phil Robertson (200 times a day) asking for interviews. He travels all over the country with his family giving speeches and teaching Bible studies. 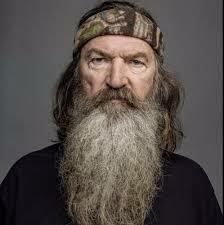 The GQ interview is an example of how what Phil Robertson said was expressed. We have the freedom to say what we want to say, but as with all actions there are consequences. Your boss at work can fire you for comments made at work. If you are a public figure, you can be fired for what you say away from the office. What seems to have changed in America is not the consequences for expressing oneâ€™s freedom of speech but the tolerance of differing thoughts.Â Dialogue and the ability to disagree are essential to a free society. When one group has power to control the outlet of opposing thoughts and ideas, then liberty is in jeopardy. Because we have enjoyed such freedoms for generations we will not fight for these rights or even care for such things until we feel the sting of their absence. America has grown indifferent to itâ€™s innate liberty because it has never known anything different. We have dumbed down our taste for entertainment to where we do not want to be made to think about things differing from the main streamâ€™s understanding of reality. This is true on the secular and the Christian side of reality. How many times have you intentionally sought after a friendship with a person of different beliefs in order to truly know them and be their friend? We see the opposing side as dangerous because they may infect our children, or others in our group will think we have compromised our ways to some degree, or I may actually learn something difficult about myself that I donâ€™t want to change. Fear and Pride. Many will sadly simply turn the channel to the next reality show with no thought that one manâ€™s views are no longer heard because they challenge or go against what has been decided is Americaâ€™s new core values. But the Robertson family have been very open regarding their beliefs. The GQ articles says, â€œDuring the familyâ€™s initial negotiations about the show with A&E, Jase told me, â€œthe three no-compromises were faith, betrayal of family members, and duck season.â€ What they believe has been no secret and the family has continued to fight to keep a certain level of reality in the reality show. A&E wants to mold this Christian family into what it feels will reach the widest viewing market. And as with all things that say something with no meaning and live life with no depth it will blow away. The reason America loves this show is deeper than long beards and guns. They see something authentic and real in a painfully scripted â€œrealityâ€ television world. They see men dedicated to their wives and families. They see families working through personality differences, and they see a successful business that is rooted in Christian beliefs. But if you are a fan of the show, then you know this already. Before I weighed in on this issue I read the GQ Interview. (be forewarned there is some crude language). I would encourage you to go and read it for yourself, but I have pulled out the quotes that I think most people are reacting to. The issue is not really about comments made toward homosexuals. A&E has the right as a network to hire or fire anyone they choose for whatever reason they choose. They are a business who is in the business of making shows that people desire to watch.The Robertsons have the right and freedom to believe what they want. Â If you donâ€™t like what happened then let them know, if enough people want him back, then heâ€™ll be back. Who knows this may just be a publicity stunt for ratings.